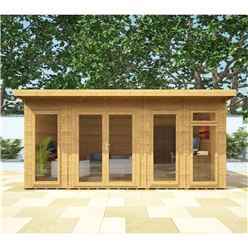 At ilikelogcabins.com we have a huge range of Summerhouses so we are sure you will find just the Summerhouse you are looking for. Sizes start from 7ft x 5ft which is perfect for a smaller inside sitting area to enjoy your garden from, or to simply store your garden furniture in when the British weather isn’t being so kind to us. 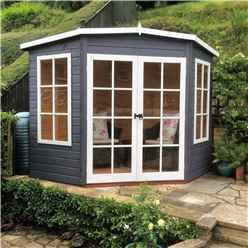 Sizes go all the way up to a large 16ft x 16ft Summerhouse which you can really make a feature of. You could turn this into a ‘quiet’ sitting space with some comfortable chairs and fill it with shelves full of your favourite books, maybe you would like to turn it into a studio, such as a music studio or an art studio. 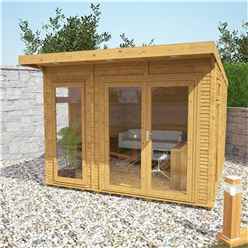 You may just desire a Summerhouse for storage as an alternative option to a shed, to just store those garden tools and your lawn mower. The uses for the Summerhouses are endless. There are many shapes and sizes to choose from. 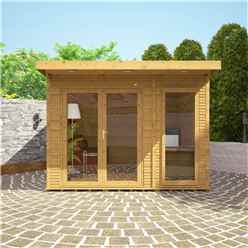 Such as Summerhouses with verandas, many windows or not so many windows, opening windows or fixed windows or even floor length windows. 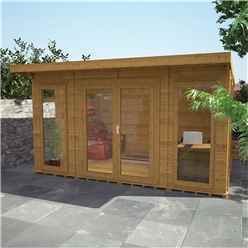 Corner cabins are available too which can reduce taking up too much garden space and fit just perfectly into one corner of your garden. 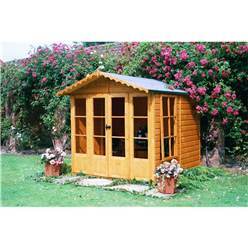 Summerhouses with apex roofs, pent roofs, perfectly flat roofs or curved roofs. 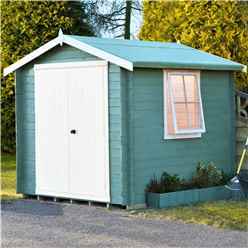 Some Summerhouses even feature a separate room for storage. 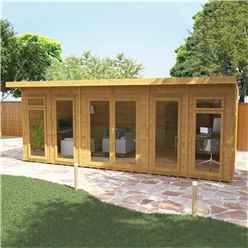 Our Summerhouses are available in different wall thicknesses starting form 28mm, 34mm, 44mm and 70mm. 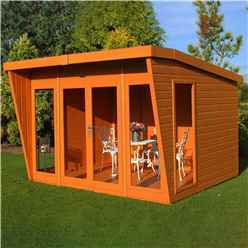 The wall thickness you require is usually based on what you would like to use the Summerhouse for. Double glazing is also available as opposed to the single glazing for the door/s and window/s. 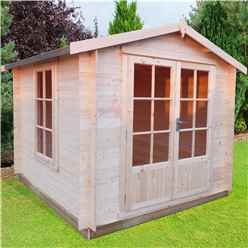 Our Summerhouses are delivered untreated so you would be required to treat the Summerhouse with a water based treatment for wooden outdoor buildings once you have installed it and then do so once or twice a year, every year. 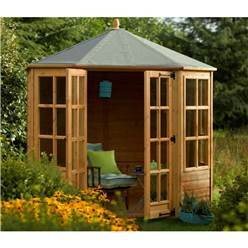 By doing this, you are providing the wood of the Summerhouse with the moisture it needs. Wood is a natural, living product so it needs caring for. 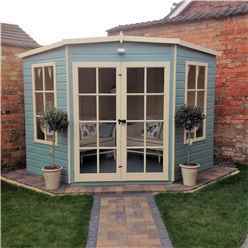 By not treating the products ourselves prior to delivering to you, we are providing you the options and creativity to choose colours yourself – Choosing the colour/s to paint your Summerhouse could be the hardest part of this process. Decisions, decisions. 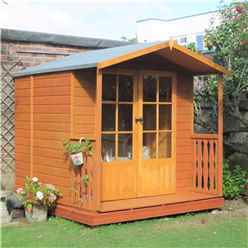 Our Summerhouse section of our website is easy to move around, providing you know the size you require. The ordering system is easy to use, as it the payment system. If you are unsure about ordering online or have any questions regarding our products, don’t hesitate to call or email us and a member of our sales team will be happy to help you. 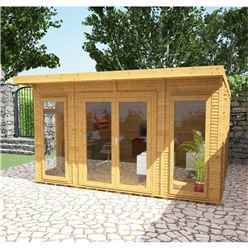 Many of our Summerhouses are available for delivery in just a matter of a few days so you shouldn’t be waiting too long to receive your Summerhouse. 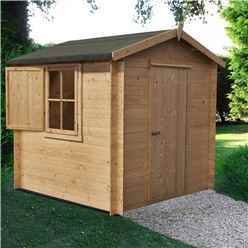 Our Summerhouses are delivered in pre made panels and include the full instruction manual and fixing kit. 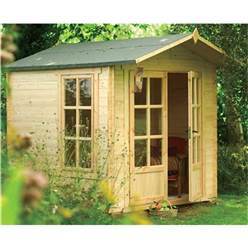 You will just need some tools, a pencil and a spirit level – no one wants a wonky Summerhouse. 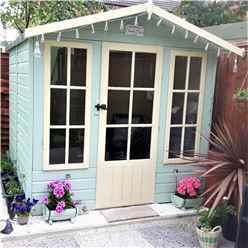 If you are unsure about installing the Summerhouse yourself, we have an installation team available which have over 25 years’ experience. 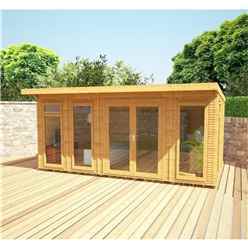 This can provide you the peace of mind your Summerhouse is being installed just as it should – perfectly. Call us today for a quote. 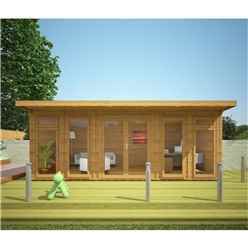 Summer houses are cleverly designed to maximise time spent in the garden and provide flexible extra living space during the warmer months of the year. 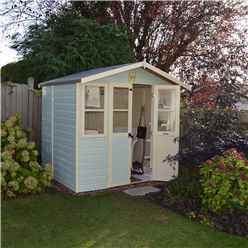 Ideally you need a reasonable amount of space to build a summer house in your garden, but even if you don’t have a lot of space, there are plenty of more compact designs to choose from. Why Buy a Summer House? A summer house is one of life’s luxuries. When the weather is fine, you can open the doors wide and sit out on the deck of your summer house, sheltered from the heat of the sun, and enjoy some rest and relaxation. On cooler evenings, rather than heading back indoors, take a warm blanket into your cosy summer house and read by candle light as the night time creatures come out to play. Traditional wooden summer houses have long been used as a place to relax and retreat from the world. Larger structures have been used as vacation properties by the sea for decades, but simpler buildings constructed in gardens are becoming increasingly popular all over the UK and beyond. 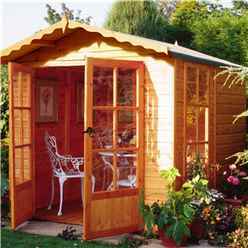 Today, a simple wooden summer house is not terribly expensive to buy and with the right care will last for many years. A well-constructed summer house can be a real selling point for any home owner looking to move to a new property, so it is worth spending a bit extra on a deluxe summer house if you are hoping to attract a more discerning buyer to your property. Design is very important when choosing a summer house. 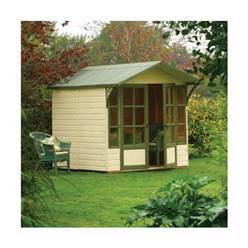 Larger structures can feel a bit overpowering in a small garden, so be careful not to choose a summerhouse that doesn’t fit well into the existing landscape. 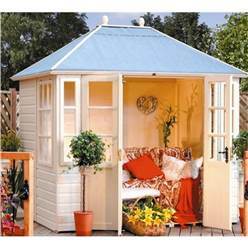 If you don’t have too much space, look at small octagonal buildings, or corner summerhouses that can be tucked away discretely during the day and then highlighted at night with pretty lighting. The main reason why summer houses are so popular is that they are a light, bright room within the garden. Sit inside a summer house with the doors thrown wide open on a warm, sunny day and you can enjoy the garden whilst remaining sheltered from the sun. To make the most of the sunshine and glorious vista, choose a summer house with ample glazing. Look for a design with double glass doors and side windows. That way you can enjoy everything your garden has to offer. A summer house is the perfect accessory if you love outdoor entertaining. Instead of retreating indoors when the temperature drops later in the evening, you can stay outside and make full use of your summer house as a place to sit, eat, drink and be merry. Make the most of the extra space with comfortable seating, pretty lighting, hanging baskets, and even a hot tub on the deck if you fancy being extra decadent. One point worth making is that wall thickness plays a big part in how long you can use your summer house for. Winters in the UK are usually cold and wet; more so the further north you live. Cheaper summer houses only have 12mm tongue and groove walls, which provide enough insulation during the summer months, but are not thick enough to keep the cold out in late autumn, winter or early spring. 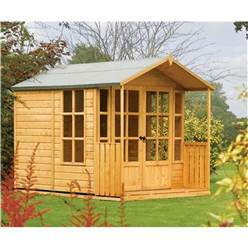 If you intend on using your summer house all year round, invest in a log cabin with thicker walls, preferably 34-44mm thick. This will ensure the building is better insulated against the cold and you won’t succumb to hyperthermia while using it. It might also be worth installing some form of space heating, to make the place even more comfortable when it’s cold outside. 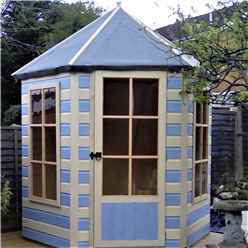 Natural timber always looks beautiful, particularly as it weathers, but if you want to introduce some colour into garden, you can paint your summer house. Natural shades look best – pale pastel blues, greens, creams and yellows all work well in garden settings – but if you want to create a statement piece in your garden, go for a more adventurous colour. 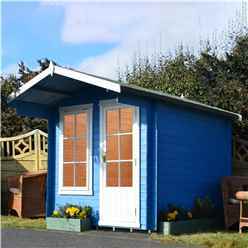 Summer houses can be used for all kinds of purposes and are flexible enough to meet most people’s needs. For example, you might buy a summer house with the intention of using it as an outdoor living space and then turn it into a spare guest room. 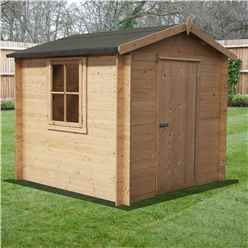 Either way, with a quality log cabin, you can look forward to many happy years of use. If you would like more information on our range of summer houses, give us a call today.